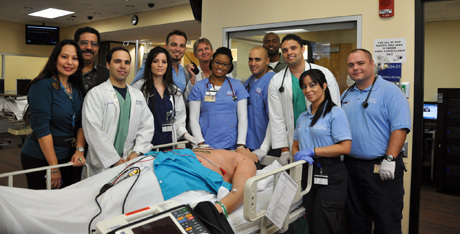 The Clinical Simulation Lab allows students to develop and build upon their acquired theory with practical skills. Equipped with multiple high fidelity patient simulators capable of presenting hundreds of conditions in realistic scenarios. The Clinical Simulation Lab allows students to practice their skills independently, but also bolsters a key principle of our program: creating an environment of multidisciplinary collaboration by bringing together students from various fields to work and communicate as a team. Ultimately, the Clinical Simulation Lab prepares students with the evidence-based principles and clinical skills they will need in clinical environments in the real world, helping them reduce errors, improve safety, and elevate the quality of patient care. The Clinical Simulation Lab has open lab hours in which students can practice and hone their skills individually or in groups, with real-world scenarios often found in healthcare. This provides students with the ability to develop clinical and critical thinking skills that are necessary in their healthcare professions. This cutting-edge patient care laboratory is designed to simulate the conditions and situations health care professionals encounter in a real-world healthcare environment. From clinics to emergency rooms our facility is equipped with the simulators and equipment utilized in different clinical scenarios. Students can practice and refine their critical thinking skills on a diversity of mannequins without putting a real patient at risk. Simulation sessions conducted in our rooms provide participants and students with opportunities to practice caring for a range of patients, from healthy to acutely ill.
Debrief is an indispensable aspect of simulation learning. The debriefing room at the lab creates a safe environment for students to review and evaluate their actions, focusing on clinical best practices. During the debriefing sessions, students use observation and real time data video recordings from all the simulation rooms to build on their knowledge. These experiences can also be shared through local network to any classroom at Medical Campus. The easy access to information allows students and instructors to evaluate methodologies, improve patient outcomes, and stimulate team cooperation. The realism of the clinical environment can be delivered to any classroom at Medical Campus thanks to the portable mannequins. Our portable mannequins allow students and instructors to enhance the lecture experience with the most advanced wireless human simulators. Students gain confidence and competence through self-reflection of their actions from the comfort of the classroom. In order to reserve a room/supplies, instructors must fill out and submit the form online under “Simulator Request Form” at the bottom right corner of this page. Instructors must request to reserve a room/supplies at least one week in advance of the desired reservation date. Instructors will receive an email confirmation validating the Room, Date, and Time. Supplies will be provided as available. Instructors that have requested portable mannequins need to be at the classroom at time of delivery and must wait until it is picked up. No mannequins will be left unattended in classrooms or sent to the lab under a student's custody. Instructors are accountable for all equipment. No pens allowed, only pencils. Monday: 7 a.m. to 4 p.m.
Tuesday - Friday: 7 a.m. to 7 p.m.